Carl Edward Kastendieck of Billings, Missouri, died peacefully at home on Thursday, July 26, 2018 at the age of 92. Carl was born December 21, 1925 in Billings, Missouri, to Karl D. and Minnie (Peiter) Kastendieck. Carl was a lifelong Billings resident and grew up during the Great Depression on the family farm, often working the fields with a team of horses. Carl was a 1943 graduate of Billings High School and was one of six siblings in a very close-knit family. 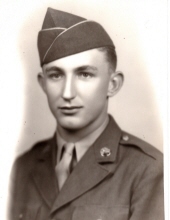 Carl served in the US Army in the Philippines during World War II as a Combat Infantryman in the Dixie Division. Carl was united in marriage to Erna Katzur on February 20, 1954. Carl proudly operated his farm his entire life, raising a nationally recognized herd of registered Guernsey dairy cattle. Later in life, he, along with his family, managed a successful beef cattle and hay operation. Carl was an avid sports fan, especially of the St. Louis Cardinals, and enjoyed playing six-man football in high school. Carl was a lifelong and active member of St. Peter’s Evangelical United Church of Christ (UCC) in Billings. Carl served on many boards throughout his life, including the St. Peter’s Church board, the Billings school board, the Billings fire board, and St. Peter’s Cemetery board. He also served as caretaker of the St. Peter’s Cemetery for 40 years. Carl is survived by his wife of over 64 years, Erna, of the home; a daughter, Mary Kay Kastendieck; a son, Paul Kastendieck; and by several nephews, one niece, cousins, and many friends. In addition to his parents, Carl was preceded in death by a son, Randy Kastendieck; and by four sisters, Josephine Cross, Ruth Gay, Mary Jane Merrick, and Anna Lee Dobbins; and by one brother, Clifford Kastendieck. Carl was known for his sense of humor, his love of his farm and his animals, and his outgoing, unique personality. He was blessed to have a full and long life that he was able to enjoy until the last moment. He will be greatly missed by family and friends alike. To send flowers or a remembrance gift to the family of CARL EDWARD KASTENDIECK, please visit our Tribute Store. "Email Address" would like to share the life celebration of CARL EDWARD KASTENDIECK. Click on the "link" to go to share a favorite memory or leave a condolence message for the family.